If the level is ok, measure what you got out and put the same amount back in. What brand of front sprocket is that please? Thanks....that was fast! Did you already have that pic in your device ready to go? Haha yes I took it with the rest of them and only noticed now that you asked that it wasn't posted. 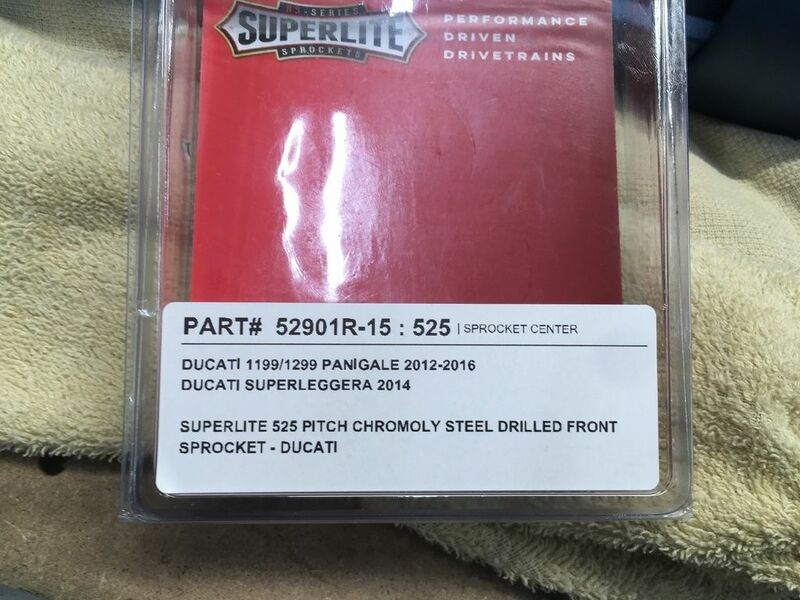 My dealer in the UK has had an update from Ducati, that the oil must be weighed and then the same weight of oil put back in. They also confirmed that the bike must sit for 1 hour, drain the oil out for 1 hour, put weighed oil back in, start bike to circulate oil, shut down and let sit for another hour, then check oil level. They also confirmed that the bike must sit for 1 hour, drain the oil out for 1 hour, put weighed oil back in, start bike to circulate oil, shut down and let sit for another hour, then check oil level. Is there a speedometer adjustment setting for the new sprocket, or is this wishful thinking on my part? Would be simple for Ducati to add the setting in a future firmware update. Agreed, 1st gear is a bit too tall. Does it get speed from the sprocket? My Monster got its speed from a sensor measuring the spin of the rear brake disc. Yes, it's set up so you can re-calibrate for final drive and tire size changes on the bike. Go through the menu to I believe it says "tire calibration" and "start". Hold the select (again just going from memory) button down and it tells you to hold it at 29-32mph indicated in 2nd gear for a bit and will then say -completed.